The ankle is one of the most complex joints in the body. It is designed for constant movement and is one of the few joints that bear the full force of the body's weight with every step you take. It is made up of several tendons and ligaments that allow the bones of the ankle to move fluidly even though it constantly carries a substantial amount of weight. Any misstep or awkward movement can damage the connective tissue in the ankles leading to a sprain. The ligaments run along the outside of the bones in the ankle joint, providing support and allowing you to move in any direction you choose. The most common of all musculoskeletal injuries, an ankle sprain can occur at any time without performing vigorous activity. Slipping on ice or twisting your ankle as you walk on uneven terrain are two causes that are frequently reported. The ankle is supported by three main ligaments that can be stretched or pulled if the joint is twisted or rolled. The severity of your injury will be determined by the number of ligaments affected and how far they have been stretched. Because the ligaments provide the stability the ankle needs to support the body during movement, stretching or compromising them in any way can result in instability and an inability to properly support your body weight. This instability normally goes away after the area has had time to sufficiently heal. 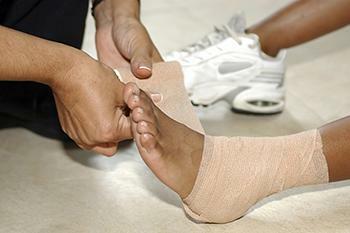 While ankle sprains are common in athletes, anyone can experience a sprain. You don't have to be overexerting yourself or running either. Something as simple as missing a step or slipping on a small stone can result in an ankle sprain. Although some sprains are more severe than others, the level of activity that causes them doesn't have to be significant. Wearing appropriate types of footwear for the type of activity you are participating in is an excellent way to prevent spraining an ankle. Because a large number of ankle sprains occur while you're walking or running on uneven terrain, it's important to watch your step and avoid trying to walk where the rocks or gravel are loose and unstable. Genetics may also play in sprains, strains and other conditions that affect the joints. If you have a family history of weak ankles or knees or if you have extremely high arches, you may be more prone to sprains and strains. Wearing shoes that fit properly and support both your foot and your ankle are the best way to avoid causing a sprain. Walking and stretching are two exercises that can help to strengthen the ankles and the feet and may possibly prevent sprains from being severe. Most people know as soon as the sprain occurs. In some cases, there is a loud “pop” as the ligament reaches its limit and starts to tear. In addition to the immediate pain and swelling you feel, you may also experience a burning sensation. The joint may feel warm to the touch and start to bruise. Because the ligaments have been damaged, it may be hard to walk and the joint may start to stiffen. The severity of the sprain will be determined by how many of the ligaments were affected and how far past their limits they were forced to go. If the ligaments are stretched but not torn, the injury may be relatively minor. During the healing process, the ankle may feel weak as if it isn't able to support the weight of the body. It may be beneficial for you to wear a brace or wrap your ankle during this time to help support the ligaments and hasten the healing process. Diagnosing an ankle sprain involves a physical examination of the injury. Dr. Fihman will evaluate how the joint functions, the level of pain and the outward appearance of the joint, as well as palpating the area to locate any abnormalities. While this will help in making the diagnosis, other tests are needed to indicate the severity of the injury. Digital X-rays – A digital x-ray is used to examine the skeletal bones and connective tissues. Damages to both will appear in the x-ray allowing the doctor to make an accurate diagnosis. MRI – An MRI is used to determine the exact extent of any damage to the ligaments. It will also show the cartilage and soft tissues surrounding the joint allowing the doctor to identify any other damage that may have been caused over and above the damage to the ligaments. Once a diagnosis has been made, an appropriate treatment plan can be developed that will promote healing, and hopefully, help to prevent future injuries. If you need to be seen by Dr. Fihman but are having difficulties getting to her office, she can come to your home with the necessary equipment to make an accurate diagnosis. Ankle sprains that remain untreated can cause permanent damage to the structure of the joint. Over time, this can lead to chronic pain and discomfort, as well as instability. The longer it takes for the joint to heal, the greater the chance of the ligaments losing strength and having a harder time bearing the weight of the body. To avoid this, it's extremely important that any type of ankle injury be examined and treated immediately after it occurs. Immediate evaluation and treatment can uncover fractures and other potential injuries that may have otherwise gone undetected. Rehabilitation is needed if the ankle is to heal properly. By using the RICE method, you can alleviate much of your discomfort. RICE stands for rest, ice, compression, and elevation. Resting the joint for the first few days after the injury allows the ligaments and tissues to start healing without being placed under pressure. Ice is used to reduce swelling and inflammation, as well as ease your pain and overall discomfort. Using a compression bandage provides support to the ligaments and the structure of the ankle as it moves and elevating the ankle during periods of rest prevents eliminates swelling and takes pressure off of the joint. If the injury is severe, a compression wrap along with a boot or small air cast may be needed to provide the ankle with the support it needs as you start to walk. Taping the ankle or wearing a brace will continue to provide support as the healing process continues and will also prove beneficial in reducing your risk of re-injuring the area. After the area has started to heal, physical therapy can be used to help you regain your strength and endurance. Physical therapy also helps to improve range of motion and flexibility. Using stretches and simple exercises can prevent the joint from becoming stiff. Ligaments and connective tissue take longer to heal than muscle and soft tissues because of their diminished blood supply, so it's important to be patient and not overdo it during the healing process. If you've had ankle injuries in the past or have a family history of weak ankles, you should take as many precautions as possible to protect yourself from recurring sprains. When you know what is most likely to cause an injury, you will be better able to prevent them from recurring. Your feet and ankles are your body's support system. They carry the entire weight of your body with every step you take so it's important to ensure they are properly cared for. Exercising and stretching on a regular basis keeps the blood circulating throughout your ankles, feet, and toes. This helps to nourish the tissues, bone and muscle alike, keeping them healthy and more resistant to injury. If you have received an ankle injury in the past, it's important to take precautions so that you avoid re-injuring it in the future. Repetitive injuries can affect the stability of the joint resulting in continued weakness and chronic pain. Take the time to treat each injury fully and completely so the area remains strong and flexible. Visit your Dr. Fihman regularly to ensure your feet and ankles are as healthy as possible. If you receive an injury and can't make it to the doctor's office, she can come to you. It's important to seek treatment immediately so you can begin the healing process as soon as possible after the injury.